It's no secret that a pool adds year-round beauty and value to your home. We are your complete source for creating the perfect backyard environment. Liquid Assets Pools is a premier, full-service in-ground pool construction company serving customers in the St. Louis metropolitan area and the Lake of the Ozarks. Because you and your family deserve the best, we specialize exclusively in the construction of gunite concrete pools. Urban Oasis, Inc. is built upon the unique creative experience and capabilities of the owner – Michael Perkowski. Twenty years of experience ranges from large high profile commercial and institutional projects, to small elegant residential installations. The past ten years have been devoted exclusively to the design and construction of pools and water features. His blend of technical design and field construction experience with artistic skill as a sculptor, provides the ability to work with water as a sculptural element at a level rarely expressed in most pool and fountain designs. Urban Oasis is more than a waterscape design and construction enterprise. It is a deeply held passion to express and share his unique brand of creativity. Tom Baker founded Baker Pool Construction in 1968 with a piece of a grain silo, a helpful suggestion, and an incredible amount of ingenuity and hard work. 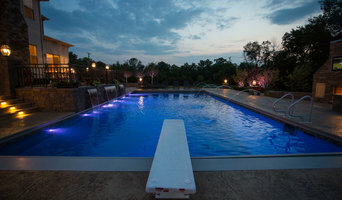 Since then, Baker Pool Construction has established itself as the leading pool construction company in St. Louis by adhering to the core principals of creativity, quality, and integrity. At Baker Pool Construction, we specialize in building custom, concrete pools. Unlike most other pool construction companies, we chose to specialize exclusively in concrete, as it is the most versatile and longest lasting construction material available. Through this commitment to quality, we carved out a niche for ourselves in the custom designed inground swimming pool market where we still proudly maintain a strong presence to this day. Our business is built mainly on referrals by existing customers and, with over 2,400 inground swimming pools built, it is easy to see how Baker Pool Construction’s outstanding reputation has allowed us to remain one of the top-rated builders for over 40 years. Baker Pool Construction works very hard to educate our customers about the intricacies of the pool construction process so that they may make informed decisions regarding their own personal project. Our knowledgeable team of experts will guide you seamlessly through the design process, taking all variables – such as budget, timeline, and client wish list – into consideration. Our designers will also prompt you to think about other important components, such as lighting, deck surfacing, hardscapes, and landscaping. After all design selections have been made and approved by the municipality, our experienced construction crew will begin installing your new backyard in a professional, timely manner. It is this consultative approach, creative design, and extensive experience which allow us to transform backyards in a pleasant manner with minimal surprises to our customers. The cost of constructing a new pool can vary significantly based on a variety of factors such as the size of the pool, land modifications required, the size of the surface deck, hardscape elements, and custom design features. Schedule your free consultation today for an opportunity to discuss the possibilities. Designer of custom in-ground swimming pools. Your outdoor spaces serve many functions, from a beautiful spot to entertain friends and family to a relaxing retreat ready to help you escape the stresses of everyday living. As a leading St. Louis landscaping company, Oasis Pools is skilled in creating spaces that serve these needs and many more. Our expert staff combines innovative design principles, old-world techniques and top-quality landscaping products to achieve the landscape you’ve always dreamed of. At OasisPools, we understand the important role your lawn and garden play in your life. Our commitment to quality is matched by our unflagging dedication to providing each client with top-quality customer service based on an attention to those individual details that make your project uniquely yours. We value our clients and respect their time. That means you can count on us to live up to our promises without excuses or delays. From the moment design begins until the completion of your installation, you’ll feel and appreciate the Design Concepts difference. Ready to create the outdoor space of your dreams? Then call us today to discuss your unique needs and to learn about all the benefits of working with Design Concepts. 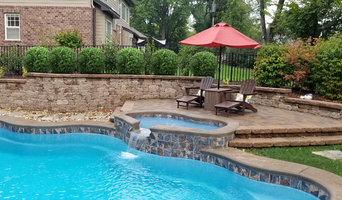 Our company has been established since 1987 creating NATURAL BOULDER STONE retaining walls, waterfalls, installing above and inground vinyl liner swimming pools with landscaping and so much more. JNR Pool Construction is a full-service inground and above-ground pool design and installation company serving Potosi, Farmington, Rolla, Sullivan and surrounding areas. At JNR Pool Construction our goal is not only to build you the pool of your dreams, but to make the process easy and enjoyable. The excellent reputation of our experienced pool installers and list of satisfied clients attest to our superior designs, attention to detail, clear communication, professionalism, and integrity. Just ask for a client reference. We want you to have an awesome outdoor space this summer. Remember, if you don’t create a great place for your family to be, they’ll always be somewhere else. 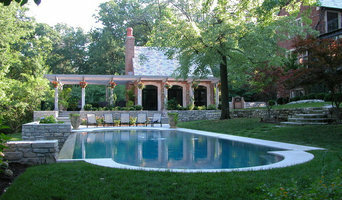 Prestige Pools & Spas is St. Louis’ most award winning in-ground pool company. We are the premier builder of residential in-ground vinyl liner, Trilogy brand fiberglass and custom gunite pools. Our award winning retail store showcases the world renowned Catalina Spas and swim spas, Island Elite and South Seas Spas from Artesian Spas, and the roto-mold line from Tuff Spas. For over 28 years we have served St. Louis and the surrounding communities, having received over 300 NSPI & APSP awards in local, regional and international categories. Our in-house craftsmen will make your dreams become a reality. Prestige Pools & Spas offers only top quality merchandise installed and serviced by friendly, professionally trained and knowledgeable employees. Our installation teams are master craftsmen and will ensure your pool is everything you dream of and more. We offer a complete line of the highest quality chemicals for your pool and spa needs along with a complete line of games, floats, fountains, and accessories to compliment your project. Our full-time, trained showroom personnel are available year-round to assist you with inquiries and provide you a sense of security in the operation of your pool and spa. Chemical analysis of your water and in-store chemical training is offered free of charge for everyone from open to close, year round. The highly-qualified professionals in our service department specialize in any service related issues pertaining to your in-ground pool, filter system, in ground liner installation, pool opening and closing, weekly maintenance, vacation services, and more. We also have fully certified and authorized Catalina Spa, Artesian Spa, and Tuff Spa technicians for all your spa needs. Prestige Pools & Spas is truly “The Signature of Quality” in St. Louis and the surrounding communities. We will enjoy assisting you to create your very own backyard dream. Heintz Pool & Spa is a second-generation pool and spa contractor for over 30 years and counting, specializing in custom pool design, water features, and pool lighting. It is our mission to give our customer’s respectable service, quality workmanship and a personalized experience from concept to completion. We offer expertise in groundbreaking technologies and stand by our craftsmanship giving you a breathtaking backyard oasis. Heintz Pool & Spa extends your living space into your backyard, giving you a luxurious get-away at home. The Pool Specialists began as a service company in 1989 and now specialize in building custom designed in-ground concrete pools. Built on a strong foundation of customer service, the company has since evolved into the premier pool builder and service company in the St. Louis region. Our commitment to the customer remains unparalleled, and it comes through in each of our projects. With over 25 years of pool construction expertise, The Pool Specialists continue to create custom high-quality pools accompanied by outstanding swimming pool service after the project is complete. We pride ourselves on delivering each and every project on time and on budget. From conceptual design to the finishing touches, we provide our clients support and guidance every step of the way. We specialize in in ground vinyl lined pools. Liner replacements are our specialty. What exactly do Town and Country pool builders do? If you are planning for a new pool in Town and Country, MO, a swimming pool builder will analyze your outdoor space and your aesthetic wishes to determine an appropriate design for your yard, installing it once the plan is developed and approved. Once installed, some pool companies in Town and Country, MO can handle the necessary cleanings, water testing, renovations and equipment replacement or repairs for your pool or spa. If not, many can also suggest Town and Country, MO swimming pool contractors or maintenance services to help with upkeep or repairs down the road. Here are some related professionals and vendors to complement the work of swimming pool builders: Garden & Landscape Supplies, Landscape Architects & Landscape Designers, General Contractors, Landscape Contractors, Solar Energy Contractors. Before hiring a swimming pool construction company to create your new Town and Country, MO pool, determine how you'll be using it. Will it be for fun or for lap exercise? Will the primary users be children, adults or a mix of the two? Knowing the use can help you find Town and Country pool builders who shares your aesthetic. Once you find swimming pool builders in Town and Country, MO who share your style, research is critical. Review customer references and comments, collect at least three to four estimates to compare, meet with potential Town and Country pool designers and builders in person and ensure that they are Missouri certified service professionals and licensed with the registrar of contractors before making any final decisions. In addition, get a sense whether they plan to complete the pool installation and be done with it, or whether they seem interested in building a long-term relationship with you. Be wary of the former: it's likely a reflection on the level of quality of the pool construction they do. Find a Town and Country pool contractor or designer on Houzz. Narrow your search in the Professionals section of the website to pool builders in Town and Country, MO. You can also look through Town and Country, MO photos by style to find a pool or spa you like, then contact the local pool company who designed it.